​​ HOUSTON – The Ivy, a 17-story, 297-unit apartment project at 2311 Mid Lane, near Westheimer Rd. between the River Oaks District and Highland Village is expecting its first residents to move in during May 2017. Rents for the Class A apartment project range from $1,738 per month for a 550-sf studio to more than $10,000 per month for a penthouse unit spanning up to 3,070 sf. 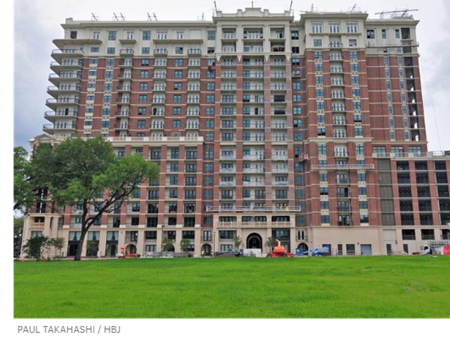 The Ivy, which began construction in April 2015, is the second phase of StreetLights Reside​ntial’s luxury apartment complex off Mid Lane in the Galleria area. ​Check out Houston Multifamily Market Research.